Are you enjoying this hot, hot summer day, while reading this blog on your PC? Or you are lucky ones that are enjoying it by the pool, or even luckier, by the sea, reading it on your smartphones and tablets? If so, finish reading this post, maybe leave a vote and/or a comment, and go back to enjoying your summer activities. For those less fortunate, who have to study for exams - I understand you. So finish reading this post, maybe leave a vote and/or a comment, and go back to studying. (As will I do, after finishing this post.) Trust me, it will be worth it. Here we go. Another Monday, another Tribute store release - this time a Fendi inspired collection. The collection is nice, as usual for the Tribute collections. But prices? Hm.. Especially as they are 'just' accessories. Not many members want to spend that much money on a tiny bag, (well, the bags are not that tiny, but still), compared to adorable dresses and outfits we have in other stores. I believe this collection will be become rare, but not much sure how wanted will it be, especially with accessories that go to our beauty parlors instead of suites, and that go over our hair, instead of under it. (Stardoll, please, please fix this!!) So I am not sure I'd be spending much money on the collection, maybe get a par or 2 of shoes, and matching bags. When we first got a spoiler for Summer Heat, some thought it'd be a new gift-o-meter (I hoped for that too), or a summer pass offer. What we got it, well some mix of those. So how it works: In 15 days many members need to buy superstar membership (any amount) in order to fill 'a thermometer'. More members buy the ss membership, more will the meter fill. When reaching certain points, you will be able to get a rewards, as shown above, with the ultimate reward being a nice window, dress, and an extra month of a superstar membership! It seems like a fantastic offer, right? Honestly, I was hoping more members will buy the membership, considering how many members are there, and how popular game is. But one thing is bothering me. So far we have reached first 2 goals, getting to reward of 10% extra stardollars. 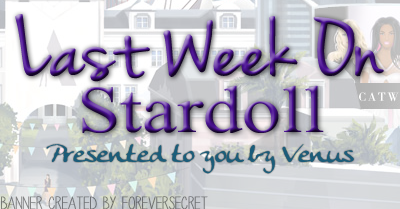 Now for the 1st 2 goals, Stardoll needed to reach 10.000 superstar membership purchased. Now I hoped it would go with the same intensity for other goals, but seeing a meter few minutes ago, I realized that for a next goal Stardoll needs to get 20.000 memberships purchased. Which means it is uncertain how much will it be needed by the end, in order to get an ultimate prize. I was planning on renewing my superstar membership anyway, but an extra month would be nice. So I would encourage you to make a purchase, even a smallest amount will count. If you want to spend a money on an online game. Considering that this is the 1st, and probably the only game I have/will spend my real money on, and the fair prices compared to other games, I find this a nice investment. On Wednesday, we got another 'prdinary' release in 'ordinary' - It Girls this time. A rather nice collection, with cute summer pieces. Fair prices and starcoin items too.A good idea for a change, instead of wearing expensive real brands, how about throwing a nice, cozy, light summer outfit, perfect for a walk through the town, visiting a beach, hanging ot with friends. Yeah, I know you cannot do those things on Stardoll, but let real life inspire your Stardoll outfits, or the other way around. Another interestng update this week, one we've been waiting for for a while - new stardesign hair pieces. 1. Why separate studio? Why not just adding those pieces to regular stardesign hair pieces? 2. Why only curly pieces? There are members that prefer straight hair, both on Stardoll and real life. 3. Why not more space for wigs? We have 2 studios, but only 8 places for wigs. Which is okay for 'ordinary' users, or beginner designers, but what about some really talented designers, who now have to delete other designs so they can buy new ones. On the other hand, there is a 'coming soon' sign bellow the sign for a new studio, so we can probably expect some straight hair pieces. Can't wait to see what they come up with, as I am not really impressed with all those curls. Items are nicely done, I am nut sure though whether they present the holiday and the overall theme well, but they seem rather different. I really love thne black long dress, my doll is even wearing it now. About other pieces, well, I rather dress my doll in ordinary stuff, as I do not celebrate the certain holiday. Nice interior, too, for making a themed room. Or just add a twist to an ordinary room. Another week gone by, full of interesting releases. What we can expect the following week? Hm... some more Tribute releases, maybe a new LE collection; right, Monday is a last chance to buy Chanel decor, so if you are still interested, you better buy it now. That's all for me for this week, and see you again in 7 days. Until that, vote and leave a comment.